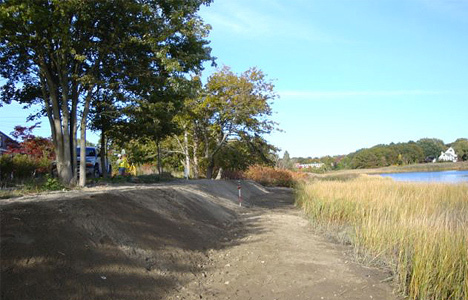 The coastal bank along Byway Road at Allin’s Cove salt marsh has been experiencing a rapid rate of erosion over the last few years. The cause was most likely wave and surf action during high energy storm events. 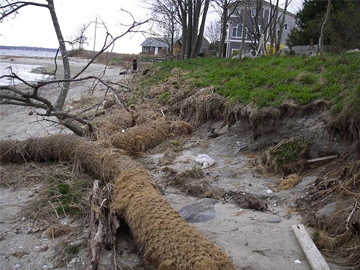 To slow down the rapid coastal bank erosion the U.S. Army Corps of Engineers designed a bank stabilization program consisting of two terrace levels of coir envelopes. 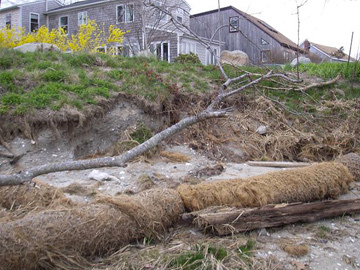 The envelopes were filled with sand and anchored into the coastal bank using helical tie down anchors every 45 feet. A row of toe anchor posts were also installed seaward of the envelopes to provide an additional factor of safety in keeping the envelopes in place during storm events. 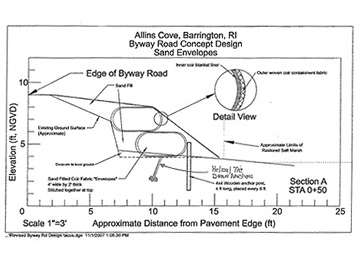 This coir envelope “soft” engineering solution was selected over other “hard” engineering rock type solutions so as to allow the resource area to be vegetated, permit the reestablishment of a bird and wildlife habitat area, and to maintain the overall natural character of the Allin’s Cove salt marsh while still protecting Byway Road from being damaged during storms.